Pizzacraft® features an extensive line of artisan quality pizza ovens, stones, tools, and accessories for crafting and baking pizzas at home in the oven, on the grill, or on the go. The cornerstone of the Pizzacraft experience revolves around the outdoor and stovetop pizza ovens and its durable pizza stones with ThermaBond® technology. No other pizza product selection on the market matches Pizzacraft in terms of quality and variety. With Pizzacraft, everyone can experience the joy of a perfectly prepared pizza – piping hot, dripping with melted cheese baked into an amazingly crispy crust. Sign up to the Pizzacraft mailing list to receive product updates, promotions and blog posts. 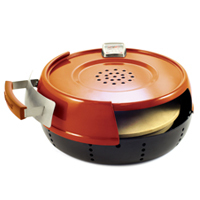 Pizzeria Pronto® is Pizzacraft’s revolutionary deluxe outdoor pizza oven. Patented technologies allow the Pizzeria Pronto to create pizzeria-quality pizzas at home or on the go, fast and easy. The oven pre-heats in 10 minutes and cooks a pizza perfectly in 5 minutes – and then is ready for another pie! The Pizzeria Pronto runs on propane so you can bring it with you to a tailgate party, on a camping trip, barbecues, or a picnic at the park. The Pizzeria Pronto rain cap (included) also holds a 1 lb. propane tank when inverted. The Gourmet Retailer awarded The Pizzeria Pronto with an Editors’ Pick award in the competitive housewares category. The award was determined on The Gourmet Retailer’s assessment of innovation, functionality, quality and overall value; and the Pizzeria Pronto excelled in all criteria. View videos and additional information on the Pizzeria Pronto. The Pizzeria Pronto® Stovetop Pizza Oven turns any gas range into a pizza oven! Just as its sister, the Pizzeria Pronto Outdoor Pizza Oven, revolutionized pizza-making on the go, the Stovetop Pizza Oven gets you wood-burning oven results in a compact and affordable appliance. Most conventional ovens can only achieve temperatures of 500ºF and require up to an hour to reach those heats. The Stovetop Pizza Oven can heat up to 600ºF in about 15 minutes, and cook your pizza in as little as 6 minutes. This oven will preheat and bake 6 pizzas in the time a conventional oven can preheat and cook just one! The Gourmet Retailer awarded The Stovetop Pizza Oven with an Editors’ Pick award in the competitive housewares category. The award was determined on The Gourmet Retailer’s assessment of innovation, functionality, quality and overall value; and the Stovetop Pizza Oven excelled in all criteria. View video on operating the Stovetop Pizza Oven. 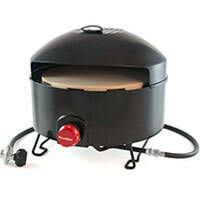 The PizzaQue™ is Pizzacraft’s basic outdoor pizza oven – and easily the best mobile pizza oven on the market. Simply set it on your tabletop or picnic table to cook. The PizzaQue pre-heats in 15 minutes and cooks a pizza in 6 minutes. The PizzaQue does not have a heat containing visor and stainless steel reflection plate, resulting in a 20% increase in cooking time from the Pizzeria Pronto. The PizzaQue weighs only 27 lbs. and is also propane operated. Pizzacraft has developed a line of pizza oven accessories that are compatible with both the Pizzeria Pronto and PizzaQue. Those items are available through select specialty retailers as well as online. *The Pizzeria Pronto and PizzaQue are protected by patent #9,016,191 & D730,105. The Perfect Pizza Grilling Stone is another innovation in pizza preparation technology from The Companion Group’s. It features two thermal shock resistant cordierite stones that lock together to form a hollow core of air, which acts as a heat diffuser. Heat from the bottom stone is transferred to the circulating air inside, which in turn heats the top stone. This ensures that it is heated evenly, with no hot spots. The Gourmet Retailer awarded The Perfect Pizza Grilling Stone with an Editors’ Pick award in the competitive housewares category in 2013. The award was determined on The Gourmet Retailer’s assessment of innovation as well as functionality, and the Perfect Pizza Grilling Stone excelled in both criteria. Achieve a perfectly browned, crispy crust every time! The Companion Group provides product information and images to assist retailers with merchandising and promotional programs. Detailed descriptions of the Pizzacraft line of artisan quality pizza stones, tools and accessories for crafting and baking pizzas at home, on the grill, or on the go.